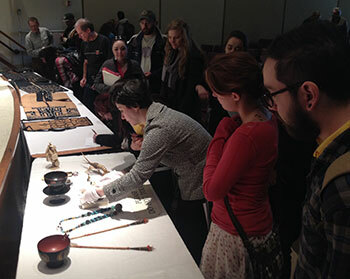 Visiting Assistant Professor Hilary Snow’s ARTHIST 383: Japanese Art and Architecture class had to the opportunity to visit the Milwaukee Public Museum, hear a lecture by Professor Snow, and see Ainu objects in the museum’s collection. Snow discussed rarely seen objects from the collection including Ainu robes, arrows, and important ritual objects. The Milwaukee Public Museum has the fourth largest collection of Ainu material in the US. Staff and volunteers from the Milwaukee Public Museum also attended the talk and viewing. We’d like to thank Al Muchka (Curator of History Collections) and Jillian Engl (Special Events Director) for making this visit possible.